Nano_Link is a general-purpose outstation with 4 digital inputs, 2 analogue inputs, 4 digital outputs and 2 analogue outputs. 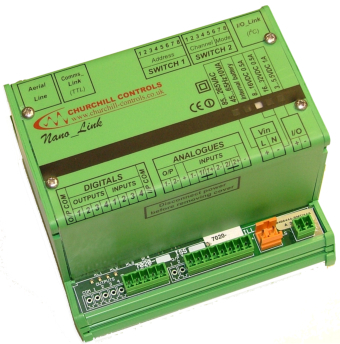 It is housed in a compact plastic enclosure, which can be clipped onto a standard DIN rail. It can be supplied in waterproof polycarbonate enclosures if required, or in a roadside cabinet. The internal power supply can be either three ‘D’ alkaline batteries, a mains power supply with battery back-up, 12VDC or 24VDC. The module has been optimised for low power consumption, to the extent that it will operate for up to 3 years on low-cost Duracell batteries. Battery operation has the advantage of significantly lower installation costs. The four digital inputs can each be used to monitor alarm or status conditions, and also to count pulses from totalised flow transducers. Extra pseudo inputs can be used to monitor alarm conditions. The two analogue inputs can be used with low-cost millivolt transducers or more conventional current loop transmitters. A pseudo analogue input monitors the battery voltage and another monitors the radio receive signal strength. The four digital outputs are volt-free relay contacts, and the two analogue outputs source 0…20mA. The capacity can be increased to 20 digital inputs and/or 20 digital outputs by adding optional digital expansion modules. Although Nano_Link is intended primarily for use as an outstation or repeater, it can be configured as a base-station to provide a simple point-to-point link to another Nano_Link, transferring up to 2 analogues and 20 digitals in both directions. However, to access pseudo inputs, use repeaters, or use more than one outstation, a Micro_Link base-station should be used.